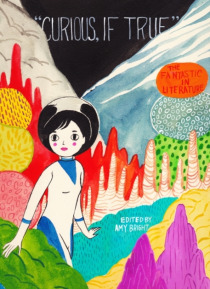 The fantastic has occupied the literary imagination of readers and scholars across historical, theoretical, and cultural contexts. Representations of the fantastic in literature rely on formal and generic types, tropes, and archetypes to mediate between depictions of "e;fantasy"e; and "e;reality. "e; Present in myth and folklore, the gothic and neo-gothic, and contemporary and mains… tream fantasy, the fantastic reach stretches into many conceptions of literature over time. "e;Curious, if True"e;: The Fantastic in Literature presents recent articles by graduate students on the fantastic and makes connections across category, genre, and historical periods. Fantasy is used as an organizing topic, a genre that has always allowed for a broad interpretation of its meaning. From magic realism, to high fantasy, sci-fi to the Gothic, this collection furthers the reach of fantasy in the study of English literature. The authors value tradition in their reading and their writing but are not afraid to reach across genre borders to show their understanding of "e;the fantastical in literature. "e; The ideas presented span years and literary periods, texts and genres, and show the undeniable value of interdisciplinary study to expand perspectives in the field of English.